Scouting is Fun! Cub Scouts offers opportunities for boys and girls to develop useful skills by participating in fun,family-friendly adventures, and group activities that build skills and memories to last a lifetime. Scouting allows boys and girls to play, laugh, develop their imaginations, and do their best! Pack 255 serves many families in Elk Grove and is part of the Boy Scouts of America Golden Empire Council, Soaring Eagle District. Cub Scouting or now as we officially call it Family Scouting, is a family activity, and as an active Scout Parent you will join in the activities with your Scout, building stronger family relationships and memories that will last a lifetime. Our pack is based at Stonelake Elementary and our boys go to Stonelake, Elliot Ranch, Joseph Sims, Carrol, and Marion Mix Elementary schools. Our program is active September through May--- Den Meetings, Pack Meetings and Special events---with family summer activities planned in June, July, and August. We also serve our community by participating in local park clean up efforts and performing flag ceremonies. On the advancement trail, a Cub Scout progresses from rank to rank, learning new skills as he goes. Each of the ranks and awards in Cub Scouting has its own requirements. 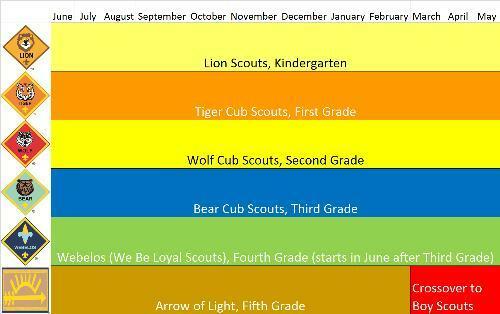 Our Cub Scouts work on their ranks during the school calendar year and our year-end advancement ceremony is in May. Family Scouting uses eight specific methods to achieve Scouting’s aims of helping boys and girls build character, train in the responsibilities of citizenship, and develop personal fitness. These methods are incorporated into all aspects of the program. Through these methods, Cub Scouting happens in the lives of boys and girls and their families. 1. The ideals: The Cub Scout Promise, the Law of the Pack, and the Cub Scout sign, handshake, motto, and salute all teach good citizenship and contribute to a boy’s and girl's sense of belonging. 2. Belonging to a den: The den—a group of six to eight boys or girls who are about the same age—is the place where Cub Scouting starts. The den is the place where the boys and girls develop new skills and interests, they practice sportsmanship and good citizenship, and they learn to do their best, not just for themselves but for the den as well. They have fun in den meetings, during indoor and outdoor activities, and on field trips. 3. Advancement: Recognition is important to boys and girls. The advancement plan provides fun for the boys and girls, gives them a sense of personal achievement as they earn badges, and strengthens family understanding. Cub Scout leaders and adult family members work with boys and girls on advancement projects. 4. Family involvement: Family involvement is an essential part of Cub Scouting. When we speak of parents or families, we are not referring to any particular family structure. Some boys or girls live with two parents, some live with one parent, some have foster parents, and some live with other relatives or guardians. Whomever a boy or girl calls thier family, is thier family in Cub Scouting. 5. Participating in Activities: In Cub Scouting, boys participate in a wide variety of den and pack activities, such as games, projects, skits, stunts, songs, outdoor activities, and trips. Also, the Cub Scout Academics and Sports program and Family Scouting’s Fun for the Family include activities that encourage personal achievement and family involvement. 6. Home and neighborhood centered: Cub Scouting focuses on the home and neighborhood. Cub scouts meetings happen in the neighborhood and helps boys strengthen connections to their local communities, which in turn support the boys and girls' growth and development. 7. Wearing the uniform: The Cub Scout uniform helps build loyalty to each other and self-respect. Wearing the uniform to all den and pack meetings and activities also encourages a neat appearance, a sense of belonging, and good behavior. 8. Making Character Connections: Throughout the program, leaders learn to identify and use character lessons in activities so boys and girls can learn to know, commit, and practice the 12 core values of Cub Scouting. Character Connections are included in all the methods of Family Scouting and are the program themes for monthly pack meetings.